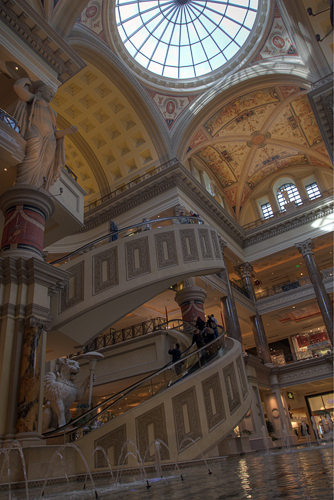 I always thought the spiral escalators at the Forum Shops were unique and interesting. I was killing time before watching Lion King at Mandalay Bay, so I stopped by Caesar's to get my POTD. This is actually an HDR. I knew I would need several exposures in order to get everything from the darker areas to the brightness of the sky light. The evenness of the photo's exposure from top to bottom tells me it was a success. Sometimes I like HDR for being obvious and surreal. Sometimes I like it because you can't even tell.